Blu Spy (head attached to battery) : "Kill me." After the Heavy is now upgraded with a Mega Baboon Heart, it was time to practice medicine against a huge army of Blu soldiers. The top YouTube comment by salley94 is valid "So why DOES﻿ the Demoman's eye not grow back?" My answer is the eye did grow back and the Demoman is just too drunk to realize the there is now a perfectly good eye under his eyepatch. Just look at the Scout who has his knocked out teeth replaced instantly. I'm more concerned with all the Blu Soldiers who all look almost identical. Usually Valve seemed to avoid showing the same class more than once if he was on the same team. I guess they needed a powerful army to warrant the uber as the Heavy stood his ground in his own video. As the heavy climbs the piles of Soldiers, notice the three star hat shown at 3:34. I hope it becomes available in the game as it looks cool. The Heavy/Medic duo really is powerful (just like in the game) and I approve of Valve attempting to explain the Ubercharge. 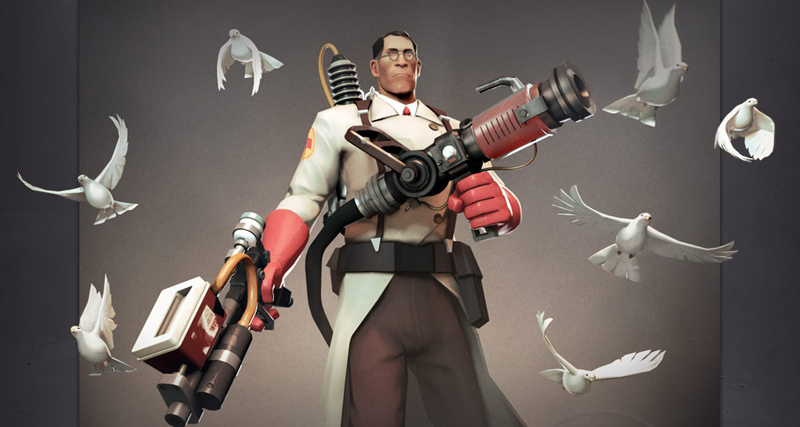 For the last film of Meet the Pyro, I hope Valve starts with the Medic attempting to perform the heart upgrade surgery and asking the Pyro to remove his clothes to begin. This will kick off the rest of the Pyro's video and we will see what lurks beneath the gasmask. With no origins and a impossible to decipher voice, it will be extremely challenging for Valve to meet the community's Pyro expectations. I'm guessing the Pyro is either Hispanic (sombrero hat), female (Scout's Mother anyone?) or a robot (limited speech capabilities). The end of the video says Team Fortress 2 is now free-to-play forever and ever. Our guess why Valve decided to make the game free-to-play forever is because they have been raking in a mint on the microtransactions, namely the hats and weapons. When they can sell a virtual hat for $10 a pop, which is more than the game costs, it makes perfect sense to invite everyone into their store to increase their customer base. Thank you Valve. I'm glad you have supported Team Fortress 2 for so long and I know you are happy with the virtual content money rolling into your pockets. I enjoyed the video, though its "ending" with the heavy and medic standing on a pile of dead solders certainly left me wanting a bit more to the aftermath of that battle. [Not just the following operating room scene]. The soldier rush seemed to be a throw-back to me to one of the earlier Team Fortress 2 trailers where the Engineer had set up a sentry as a rush of blue soldiers came rushing through to their deaths, making few pitiful pot shots. Also of note, that this video appears to take place chronologically first before anything else in the series, judging by the choice of names and descriptions to the Uber pack's now included medic weapons. Meet the Pyro, I won't wait 2 years for you, so hope to it my fiery demon. I have been go through the whole content of this blog which is very informative and knowledgeable stuff, great video love it…. I would like to visit again. WELL! It's only free to play for the week, then it's gonna cost money again. …i enjoyed going through your post! it is worth reading ,and also the video is really nice and entertaining! I like this video.Team Fortress 2 is a fantastic and wonderful game.I like graphics and challenging event of this game.I really enjoyed this game with medic and heavy. I m very impressed this game ……its a very beautiful & entertaining game ..